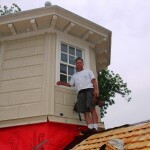 The Cupola House Association has been an excellent steward of this National Historic Landmark for over 90 years. The recently completed two-year conservation and repair project, spearheaded by members of the Association, was successful along with their extraordinary effort in securing donations and grant funds, including a Save America’s Treasures grant from the National Park Service. 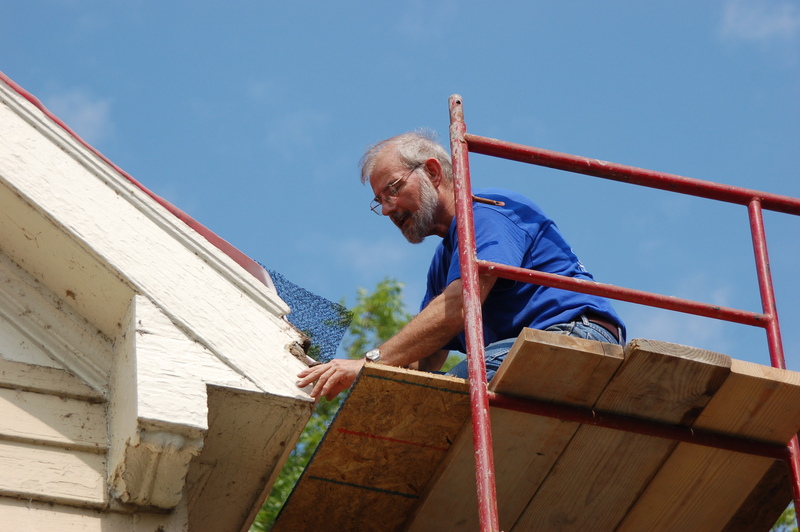 Cupola House board members were also determined to achieve “museum-quality” work standards as well as select appropriate and high-quality materials for the project. 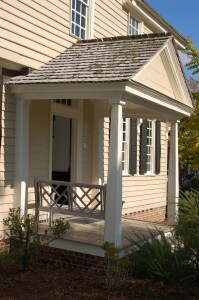 One of the major components of this project was replacement of the wood shingle roof. 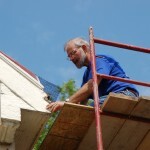 Peter Post of Richmond, Virginia, consulted on reroofing the house (Fig. 2). 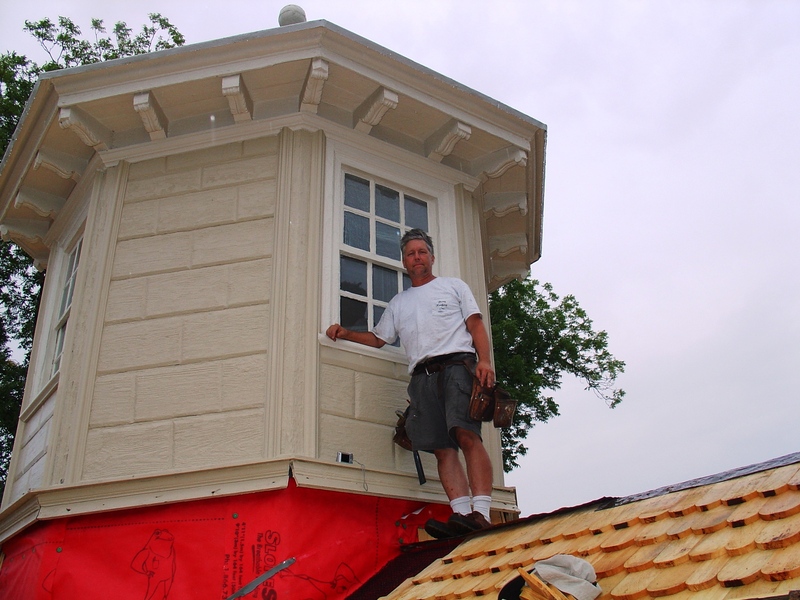 Mr. Post was recently involved with roofing work at James Madison’s Montpelier, George Mason’s Gunston Hall, and Mount Vernon. 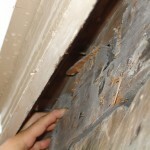 While removing the old shingles two important discoveries were made. 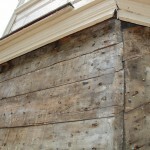 Peter Post and Don Jordan, Cupola House Association board member, volunteer, and master cabinetmaker, uncovered evidence that suggests that the house was originally clad with “rusticated” siding (Fig. 3). 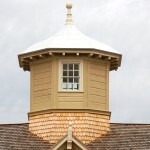 The cupola still retains rusticated siding (Fig. 4). 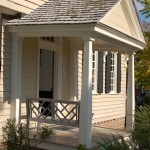 Rustication was a fashionable eighteenth-century treatment where wooden siding boards were cut to simulate stone. Sand was often applied to the freshly painted surface of the siding for a more realistic stone appearance. Rusticated siding on historic New England buildings was sometimes installed on all four sides, just the front elevation, or the front and sides and not the rear. 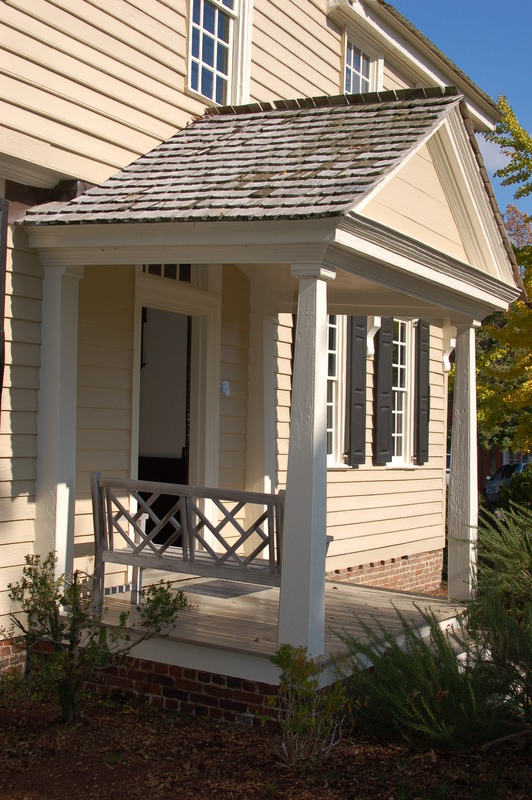 Perhaps one of the most recognized historic homes in America with rusticated siding is Mount Vernon. During the recent re-roofing of the early nineteenth-century front porch, several pieces of weathered yellow-pine “rusticated” siding were discovered in the framing system. 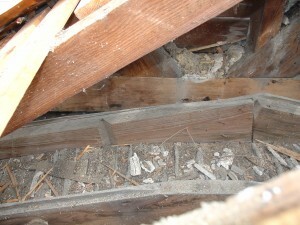 These boards were re-used as nailers for attachment of the porch ceiling plaster lath (Figs. 6 & 7). 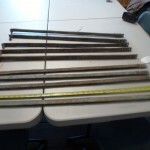 While these boards were consistent with the rusticated siding that survives on the Cupola, most of these pieces are too long to have been used in that location (Fig. 8). 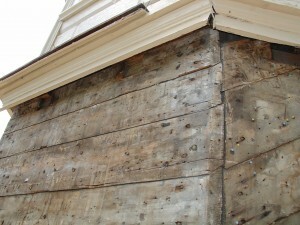 Several of these re-used boards measure more than five feet in length and retained deteriorated paint evidence. 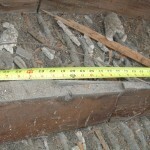 This combined evidence suggests that a portion or perhaps all sides of the Cupola House was originally clad with rusticated siding. Why did the house get re-sided approximately sixty years after construction? 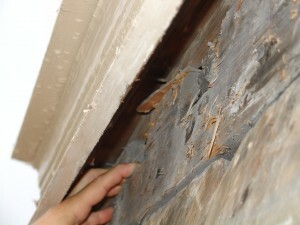 Was the siding replaced because it was out-of-fashion? 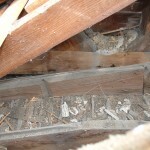 While the remnants in the porch ceiling show significant weathering, the durable resin-rich yellow-pine boards likely would have weathered many more generations. Fig. 6. 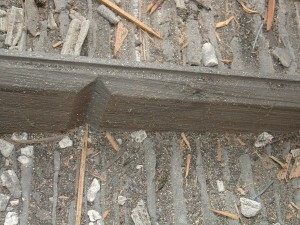 Rusticated siding used as nailers in south porch ceiling – photo courtesy Don Jordan and Peter Post. Fig. 7. 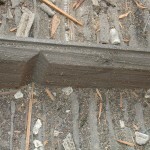 Close-up of rusticated siding in south porch ceiling – photo courtesy Don Jordan and Peter Post. Fig. 8. 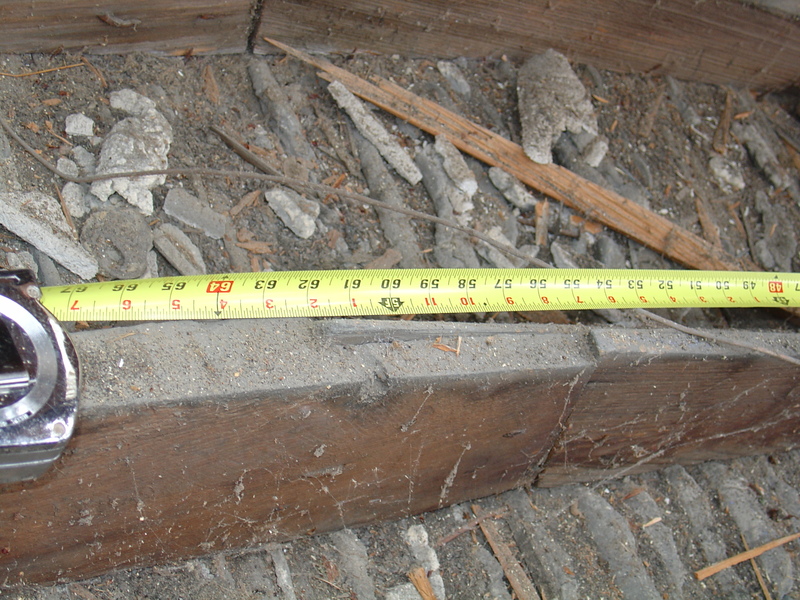 Rusticated board measuring 5 feet 2 inches – photo courtesy Don Jordan and Peter Post. Fig. 10. 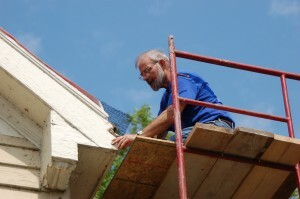 Peter Post pointing to cut-off joist at cupola floor level – photo courtesy Don Jordan and Peter Post. For safety and aesthetic reasons a balustrade presumably would have wrapped around such a platform. 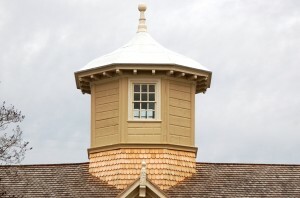 With the detailed carvings and moldings on the exterior of the Cupola House it seems reasonable to suggest that a platform would have also been nicely finished. 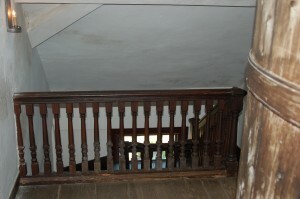 Turned balusters similar or identical to the surviving ones in the interior staircase, ascending to all three floors, might have been used in a cupola balustrade (Fig. 12). 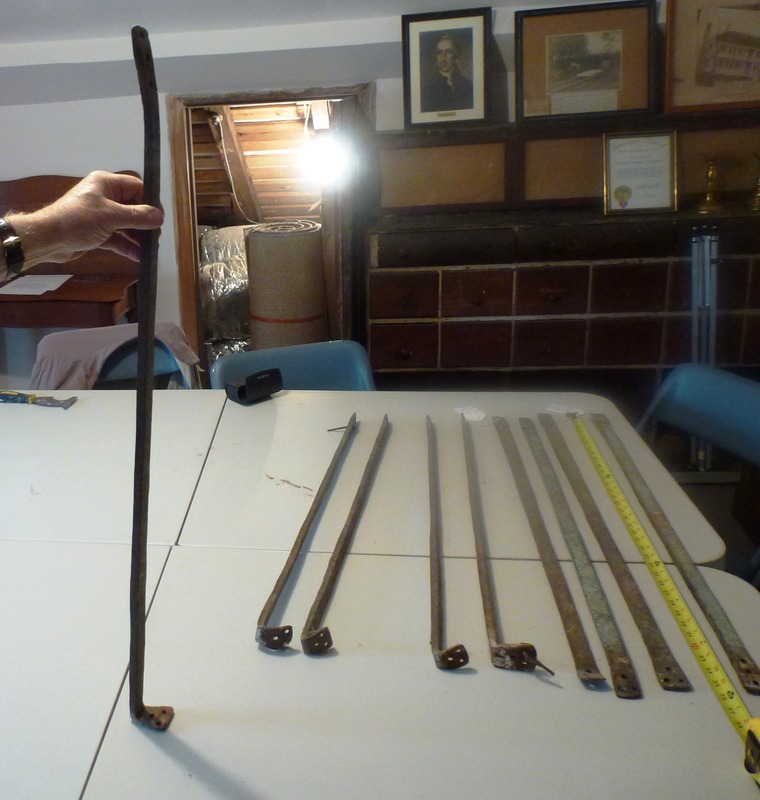 Tucked away inside the third floor northeast attic space are ten flat wrought-iron bars measuring approximately three feet in length. 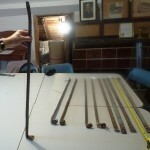 Ends on some of these bars are angled with holes punched through on each end (Figs. 13 & 14). A few handwrought nails with leather washers survive in a small number of the bars. 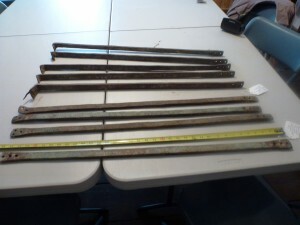 There are traces of old paint on the bars. 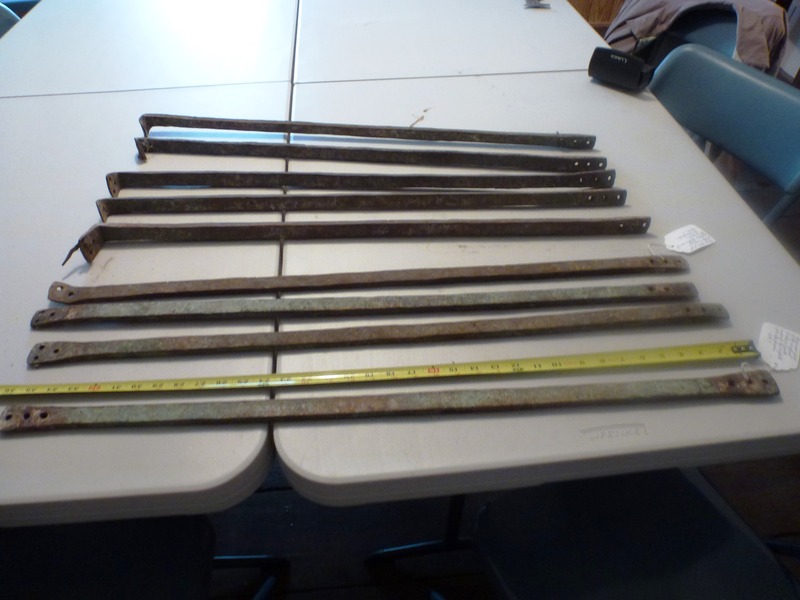 These blacksmith-made bars have been a mystery for quite some time. 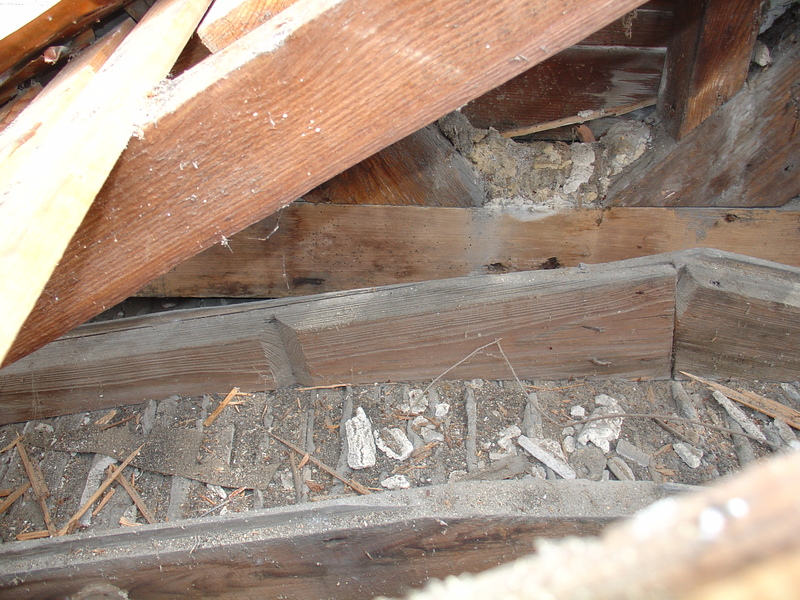 Buried beneath salvaged timbers, architectural components and other family objects in the attic, the bars appear to have been undisturbed for generations. 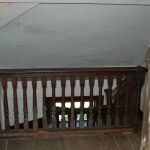 A few were removed and examined during the 1991 architectural investigation though remained a mystery. Could these bars be associated with a platform? If so, what was their use? Did they provide support for a balustrade and/or for the platform base around the cupola? 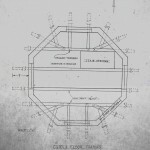 If these were used to support the platform can they provide clues to the depth of this feature? 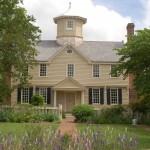 In Virginia, the Governor’s Palace at Williamsburg, Rosewell Plantation in Gloucester County, and George Washington’s Mount Vernon all had cupolas. 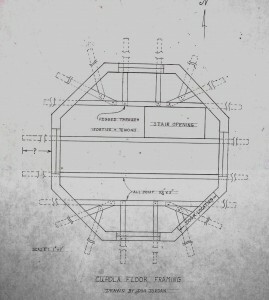 The eighteenth-century Bodleian Plate depicting public buildings in Williamsburg, Virginia, contains a sketch of the first capitol building illustrating a platform that wraps around the hexagonal cupola. 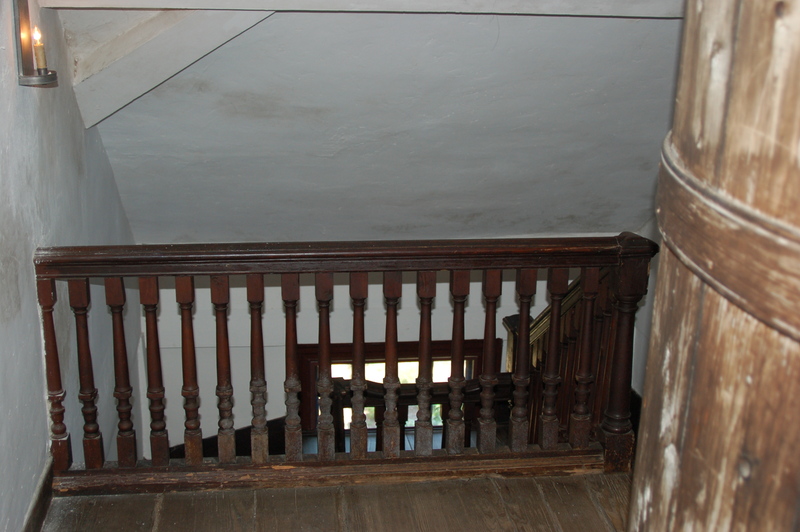 The platform in the drawing shows turned balusters in the cupola balustrade. 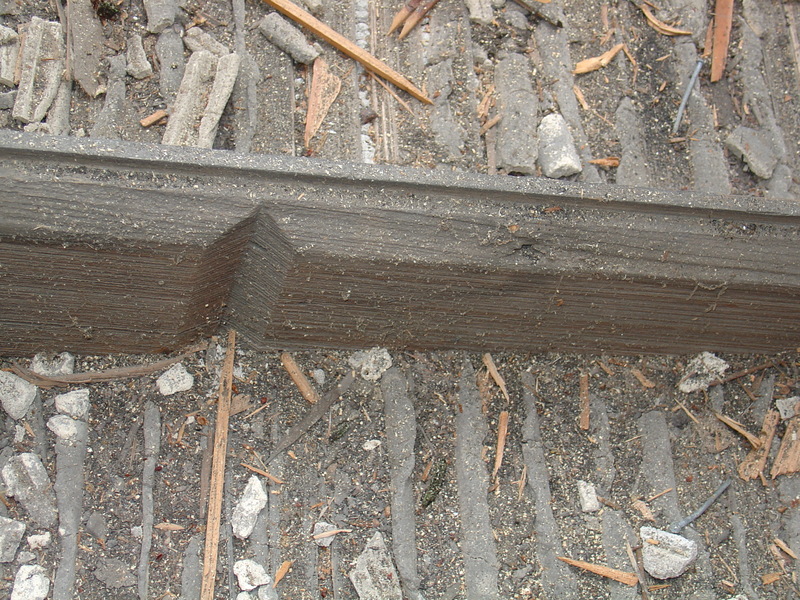 This feature was incorporated into the 1930s capitol reconstruction along with rusticated siding. parallel the 1739 Colony House in Newport, an important Baroque building attributed to Richard Munday. In England, a 1693 three- story house with jettied upper stories in Bury St. Edmunds, Suffolk, has a stylish cupola set at the juncture of the main block of the house and a rear ell”. 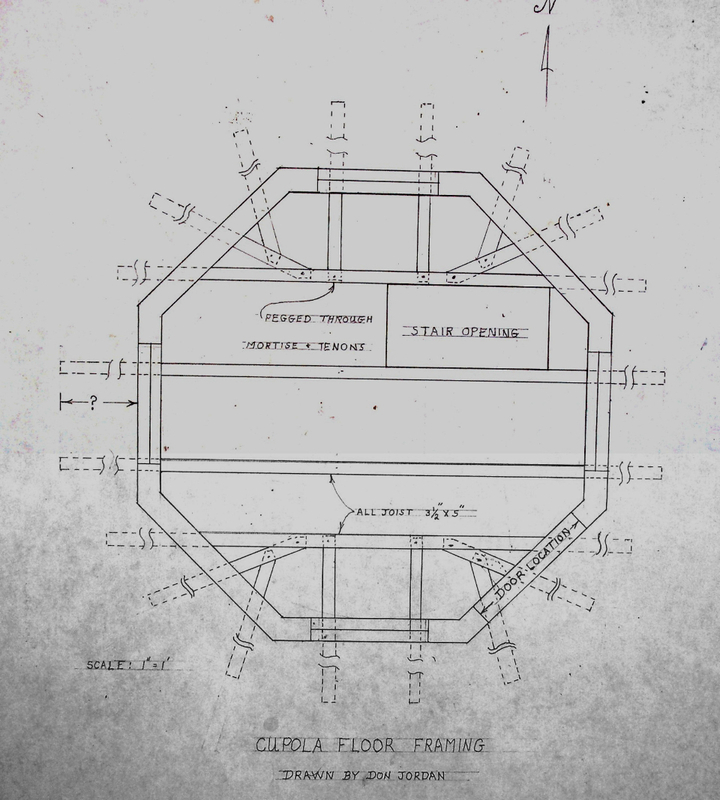 If indeed a platform surrounded the cupola as evidence strongly suggests, what influenced the builder or Francis Corbin to add this unique feature? Did Corbin loosely model the cupola from a building that he was familiar with in England, the Colonies or architectural pattern books? 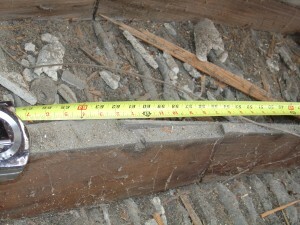 While answers to these questions may remain a mystery, perhaps when the current roof needs replacement in the future (hopefully, well in the future) further investigations can be carried out to search for additional clues about the Cupola House platform. 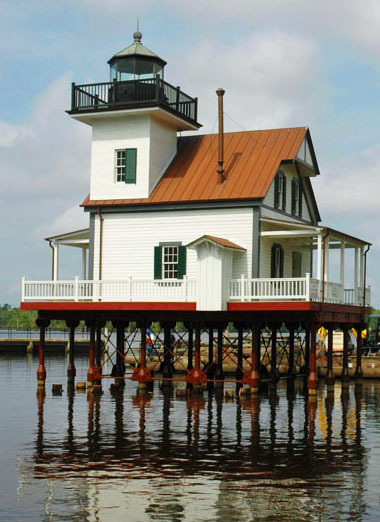 With the completion of this recent project, the Cupola House Association has once again demonstrated their outstanding commitment and stewardship for this most important National Historic Landmark. The members of the Cupola House Association, their consultants and craftspeople, and their many supporters should all take pride in their success and recent discoveries about this famed house. Special thanks to Frances Inglis, Don Jordan, Jim Melchor, Tom Newbern, Dennis O’Neill, Peter Post, and Julie Thomas for their assistance with this article. “New England Architectural Historian Visits Cupola House.” Carolina Comments 39, no. 2, (March 1991). 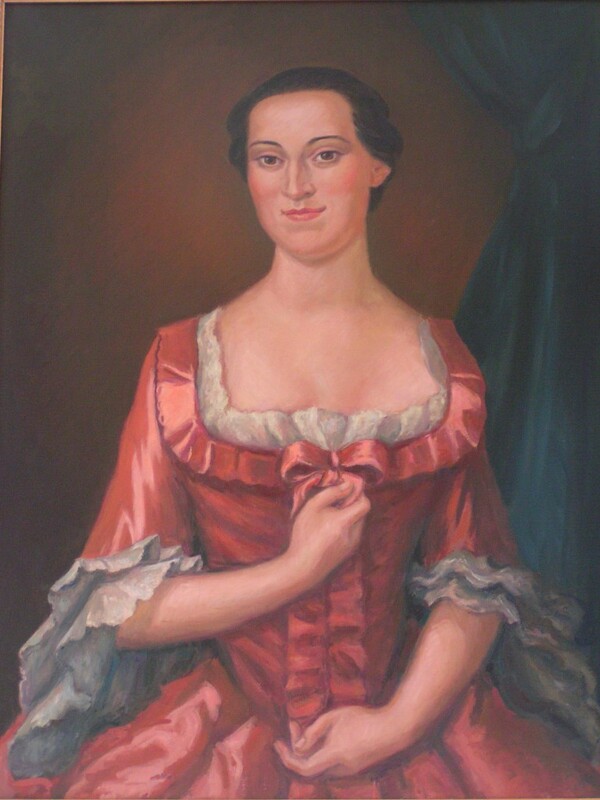 Mary Ann Coffey and Murphy Moss, Deliverance of a Treasure: The Cupola House Association and its Mission, (Fuquay-Varina, N.C.: Research Triangle Publishing, Inc., 1995). A remarkable team effort was spearheaded by Cupola House board members Robert Quinn, Dennis O’Neill, Thomas Wood, David Granger, and Don Jordan to secure funds and oversee the restoration and conservation work. O’Neill, Dennis, E-mail interview. 7 November 2012. Author’s participation in the1991 and 1992 architectural study. 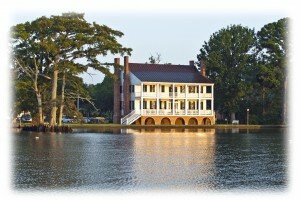 Mary Ann Coffey and Murphy Moss, Deliverance of a Treasure: The Cupola House Association and its Mission, 3-4. Post, Peter, interview by author, telephone interview. 8, November 2012. Post, Peter, interview by author, telephone interview. 16, October 2012. Jordan, Donald, interview by author. 5 November 2012. Chappell, Mack, “The Cupola House and Its Associations” The North Carolina Booklet 15, no. 4 (April 1916): 216. Carl R. Lounsbury, An Illustrated Glossary of Early Southern Architecture and Landscape, (Charlottesville, VA.: University Press of Virginia, 1999), 105 – 106. Leviner, Betty Crow, “The Pages of Rosewell,” Journal of Early Southern Decorative Arts 13, no. 1 (May 1987): 16. 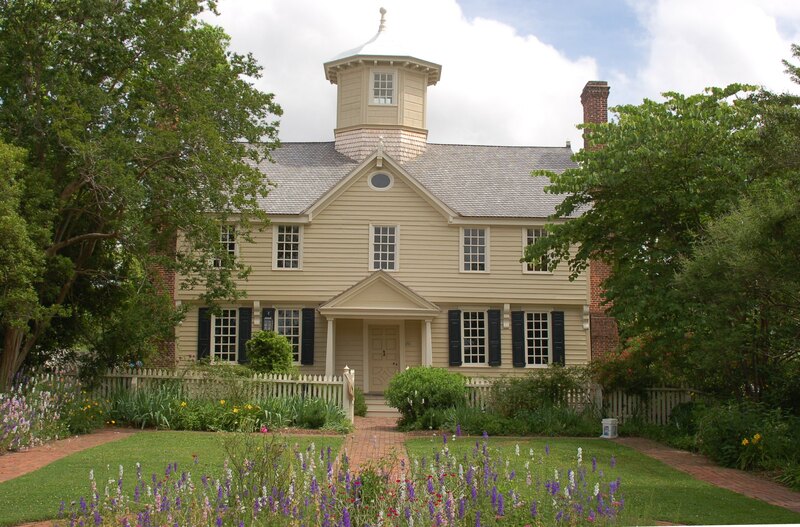 Marcus Whiffen, The Public Buildings of Williamsburg, (Williamsburg, VA.: Colonial Williamsburg Foundation, 1968), 49. 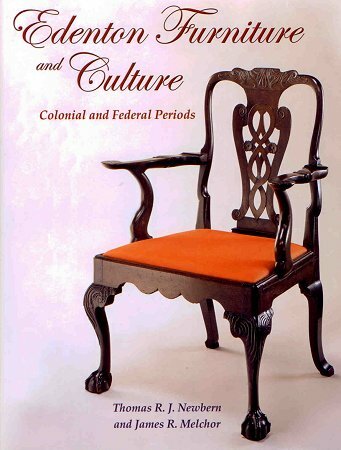 John Bivins, James Melchor, Marilyn Melchor, and Richard Parsons, “The Cupola House: An Anachronism of Style and Technology,” Journal of Early Southern Decorative Arts 15, no. 1 (May 1989): 67.